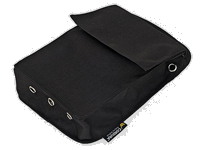 Spacious pocket can be glued or sewn to your dry or wet suit. Grommeted water drain holes. Side panels are designed to keep pocket flat when empty, yet provide enough room for spare mask, or reels and lights. Two top grommets to clip off your reels and Golem notes. Top quality workmanship, genuine Cordura material. GREAT for the price. Added these to a DUI TLS 350 and can easily fit mask and backup goodman in one side, SMB and spool in the other with room to spare. Compared to the price of many other brands, these are pretty hard to beat. Thanks Golem! Just bought one and wondering what kind of glue I must use to fix it on my dry suit (trilaminate) ? I'm extremely pleased with the quiality of these pockets. Glued very easily onto my Whites Polarflex drysuit. Perfect DIR pockets at an amazing price. Buy em! This is an excellent pocket. Strong cordura material with neoprene back making it easy to glue on. Awesome value! High Quality Construction, As good as pockets twice the price! A steal at this price! The workmanship on this pocket is superb! The material is sturdy, the stitching is very nicely done and the fact that it's got a neoprene backing is great too. For the price, this pocket is a steal.